What car looks like a sub sandwich on wheels, swings like a hammock, and has space for a game of gin? Why, the Stout Scarab, of course. An experimental, futuristic car created by aviation engineer William Bushnell Stout who called it a "travelling machine", it had a host of new-fangled mechanical and design features. The car topped out at 80 mph and, on the road, produced a little more than 18 miles per gallon. While fewer than ten of these marvels were ever made, a handful of those still survive and the Scarab turns heads whenever and wherever it appears. 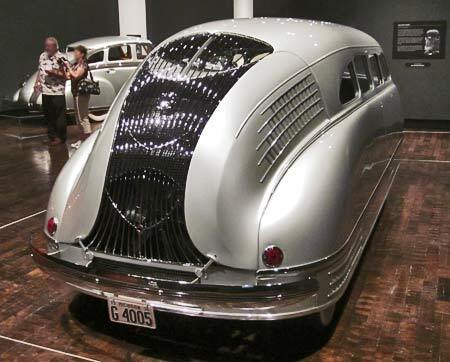 The car was conceived in the thirties when Art Deco reigned and sleek lines, tear-drop shapes, and impressive waterfall grilles ruled the car kingdom. While Stout was known as the American Leonardo da Vinci, his car was likened to a turtle, an oversized bullet, or a giant beetle. Despite its stubby looks many thought ugly, it was variously hailed as a sky car, the car of tomorrow, or a car with sideways streamlining. And this early fastback with teardrop streaming at the rear may well have been the world's first production minivan. The Scarab was developed by Stout Engineering Laboratories in 1932 as a concept car, and Stout Motor Car Co. of Detroit was formed in 1934 to produce it. By 1935 a version slightly revised mechanically and stylistically was available. The cars were made until 1939. A 1936 ad extolling its features called it "A Challenge and a Prophecy". In an illustrated panel of a night scene, a couple stands atop the stairs of their wooded home gazing down at the blue Scarab sitting on a stone-paved driveway. Text explains this marvel of the future and its many features: "Engine in the rear • Unit body—no chassis • Inside floor area—7' 6" x 5' 7" • Running board and hood space usable inside body • Loose chairs, adjustable to all positions • Rear davenport seat convertible to full-length couch • Card and dining table • New, full-vision driver's position • Thermostatically controlled heat • Forced, draftless ventilation, with rain, dust and insect filter • Fully insulated against sound and temperature • Smooth body lines minimizing wind noises • Concealed, recessed rear window • Grill-enclosed headlights • Electric door locks—no projecting handles • Flush-type hinges • Exceptionally long wheelbase for overall length (no overhang) • Minimum unsprung weight • Soft, individual springing of all wheels • Less weight on front axle—for easier steering • Maximum brakes at rear—not front—for safe, rapid deceleration • Slanted windows, no reflections." The Scarab was definitely different. 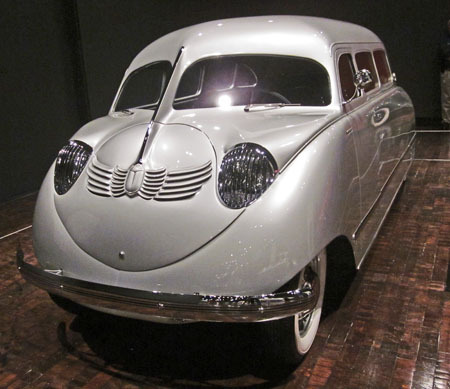 While production cars of the day had a separate frame and body, the Scarab utilized instead a single (unitized) body. One of the earliest space frame chassis, the car's skeletal frame was made of connected tubular steel components with a lightweight aluminum skin. Stout is said to have chosen the "Scarab" name because the scarab beetle had an exoskeleton. Other production cars had a front-mounted engine, placed lengthwise behind the front axle. The hood covered the engine compartment, making all that space unavailable to the car's occupants. The engine connected to the transmission directly behind it and, through a connecting drive shaft, drove the rear axle. Because the floors in these cars had to allow for the transmission and drive shaft, passengers became used to straddling a hump in the middle of the floor. Since the Scarab placed a Ford-built flathead V8 engine at the rear, it could utilize a low, flat floor for its roomy interior, giving it sufficient room to fulfill Stout's vision of an office on wheels. There were no running boards, no hood, and since there was no separate frame, passengers had an unobstructed cabin. Greater spaciousness was also accomplished by moving the driver's seat far forward, with the steering wheel nearly directly over the front wheels. The forward placement of the driver's seat, coupled with the sloping front and slanted windows, offered the added advantage of greater visibility. When it came to rear vision, however, someone wasn't paying much attention. There were no rear-view or side-view mirrors and only a tiny rear window. Since the fan grille covered the small, recessed rear window, it's anyone's guess as to how a driver saw out or, for that matter, removed snow from the back window. 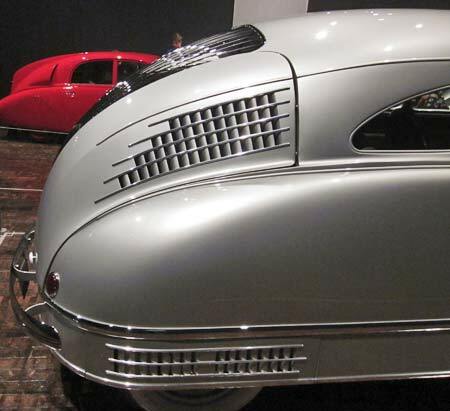 1936 Stout Scarab rear window is located behind a grille which even further limits rear visibility. Stout considered the rear placement of the engine one of the key attributes of his Scarab. He explained why: "In steering a front-engine car, the passenger in effect must turn the weight of the engine right and left when he steers. If the front of the car is lighter, steering is much improved." He went on to describe a situation occurring when a front-engine car brakes suddenly, the engine weight tipping the car forward and tending to spin the car: "When you brake the present motorcar, the weight of the car surges forward, throwing most of the braking load on the two front wheels. Thus, when you brake at high speed, you have in effect two-wheel brakes [Note: because the rear wheels come off the ground] and the car wants to double back on itself." Presented with that possibility, Stout elected to place the water-cooled V8 engine and transaxle (a custom-built, three-speed manual transmission combined with axle) in the rear. Reversing the engine from its customary position, he mounted it directly above the rear axle, with the flywheel and clutch facing forward. The transmission was located forward of the engine and mounted to the differential by means of a chain coupling. This resulted in a reversed and lowered drive train. In this configuration the radiator (which gets cooling air through a duct arrangement from the air intakes located in the rear side quarters of the car) sat ahead of the engine, ensuring greater accessibility to the engine for making repairs. In fact, to make repairs, a repairman jacked up the rear of the vehicle, unbolted the engine's cradle, and rolled the entire engine assembly out on the rear wheels. Freed from the rest of the car, servicing was a breeze. Air coming in through side vents was ducted through the radiator to cool the Ford flathead V8. A number of other improvements resulted from placing the engine in the rear, including reduced vibration and noise, cooling air exhausting to the rear, and elimination of gases from the passenger cabin. It would be years, however, before other car makers gave the rear-mounted engine a try. Although most cars of the time utilized rigid axles and leaf springs, Stout once more chose something else for the Scarab--independent suspension with coil springs on all four corners. An outgrowth of aircraft landing gears, the Scarab's springs were wrapped around oleo struts. "A" arms were used for front suspension while swing axle suspension was used at the rear. With the weight of the engine at the rear, a lightweight body, and coil spring suspension, the Scarab rode smoothly, handled exceptionally well, and got good traction. In a March 1936 Popular Mechanics article, Stout explained that the car's center of gravity was below its supporting points, much like a hammock: "With this pendulum type of suspension, there is an actual banking movement of the body as the car rounds a corner. The car is supported between the two suspension members at the front and rear of the body, or fuselage." In road tests, an ash tray or a glass of water placed on the car's table stayed in place as the car took bumps and rounded curves. Some say John Tjaarda, the Dutch body stylist who brought us the modernistic Lincoln Zephyr, styled the Stout Scarab. Others, however, assert only that the Scarab is a takeoff on Tjaarda's 1931 Sterkenberg streamliner. Whatever credit may be due Tjaarda, it seems that industrial designer Lester Johnson, initially hired to design the car's interior, certainly lent his vision to exterior features, as well. Further, a designer known as Gaston is responsible for the decorative (some say ill-conceived) moustache panel below the split windshield as well as the thin grills over the headlights. 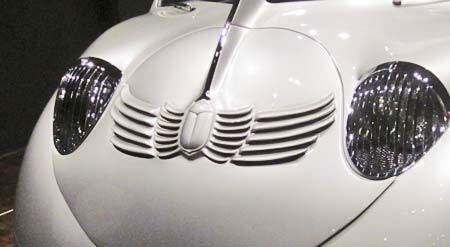 The moustache panel shows a scarab beetle in relief, with eight legs abutting five additional curved grille lines that act as ventilation intake. Moustache panel showing scarab beetle and ventilation intakes. One of the more remarkable features about the stylish interior is its configurable seating. The adjustable driver's seat and the rear bench seat were fixed but another two lightweight reclining seats could be positioned as you liked or even removed from the vehicle. All seats had a cast magnesium frame and were upholstered in fine quality pleated leather. 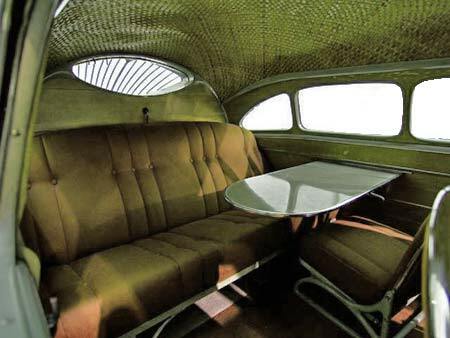 That arrangement meant you could hold an office meeting or host evening cocktails in the back of your car. And you could use the large fold-down table for card games, light snacks, or a desktop. Three full windows and a wing window on each side provided ample light for any of those arrangements. Moveable "furniture" allowed flexibility in seating arrangements. Obviously safety took a back seat [pun intended] to that flexibility. Floors were carpeted, high quality balsa wood was used at the rear and sides, and the headliner was a rich, woven wicker. There was indirect lighting above the windows, a thermostat to control temperature, power door locks, glove compartments on both sides, and even a dust filter to clean the air. The scarab motif appeared at the center of the banjo style steering wheel. Up to a hundred Scarabs were to have been made each year at a small Dearborn factory and sold for five thousand dollars (about $83,000 today) to those invited to purchase one. But keep in mind that this was in the years just after the Great Depression and that an Auburn boat tail speedster of the day sold for $2250. Even its high sales price, however, did not cover the cost of manufacture, and nearly all of those produced went to Stout board members, including such notables as Phillip Wrigley (chewing gum), Willard Dow (chemicals), Harvey Firestone (tires), and Frank Stranahan (Champion spark plugs). Even though Stout never secured appropriate financing and the car was not a commercial success, it did fulfill Stout's dream of a lighter, more efficient car with greater roominess, lighter steering, and smoother ride. Bolstered by his motto: "Simplicate. Add lightness. ", he had produced a car very unlike those on the road in the thirties. By 1942, however, with the onset of WWII, Stout gave up on his dream. It would be many years before many of his innovations began to be used in other production cars.